Many have heard of the several fabric and faux leather contents, but few know their benefits. Below is the list of all of our fabric and faux leather contents, and what they mean to your project. 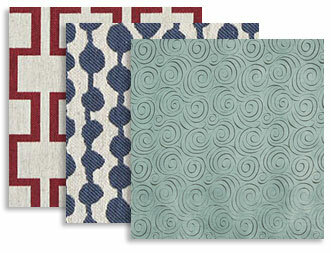 Acrylic is a well known upholstery fabric content. Acrylic textiles are usually lightweight and soft. Acrylic fibers have high light-fastness, and are more resilient than many other fibers. Acrylic is resistant to oils and sunlight exposure. Cotton, one of the most popular fabric materials, is known for its looks and feel. Cotton is not very elastic, but offers great breathability. Cotton can absorb in above average amounts of water before feeling damp. Flax fibers, which come from the same plant as linen, are soft but very durable. Flax holds its color over time, and is considered to be environmentally friendly. Nylon fabrics are stain resistant, and very easy to clean. In fact, nylon is able to be machine washed. Nylon is very abrasion resistant and highly resilient. Nylon fibers are light weight, but extremely strong. Olefin is an underappreciated synthetic fiber. Olefin is known for its strength and colorfastness. This type of material is also resistant to stains, mildew, abrasion and sunlight. Olefin is easy to clean, but it should not be dry-cleaned. Polyester fibers, one of the most used in the world, are known for their durability, resiliency and resistance to abrasion. Polyester is also easy to clean, and retains its form well. Polyurethane is the green alternative to genuine leather and vinyl. Polyurethane feels and looks like leather, but is synthetic, pvc free and arguably more durable. Polyurethane also is less expensive than genuine leather, and is sold by the yard, rather than the hide. Rayon, also known as Viscose, is a semi-synthetic fiber, and is popular for upholstery fabrics. Rayon can emulate the feel of wool, silk, cotton and linen. Rayon textiles are soft and comfortable. Rayon is absorbent, but it does not insulate body heat. This makes rayon ideal for humid spaces. Recycled Leather is composed of two main parts: genuine leather and polyurethane. Recycled leather takes genuine leather for the backing and environmentally friendly polyurethane for the face. The end result is a top alternative to genuine leather, but at a fraction of the price. 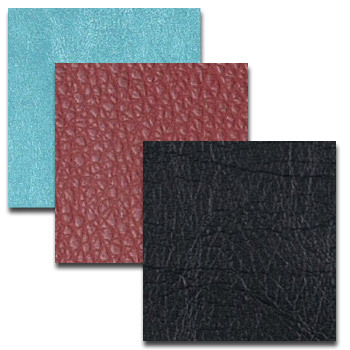 Recycled leather feels and looks like genuine leather, but is more color consistent and sold by the yard. There are different grades of recycled leathers, but we only offer the best.